During the period 2008-2011, Colombia imported an average of 8,290 tonnes of asbestos a year. A brief look at the import data raises some uncomfortable questions as indications are that the use of asbestos, an acknowledged carcinogen, is increasing. 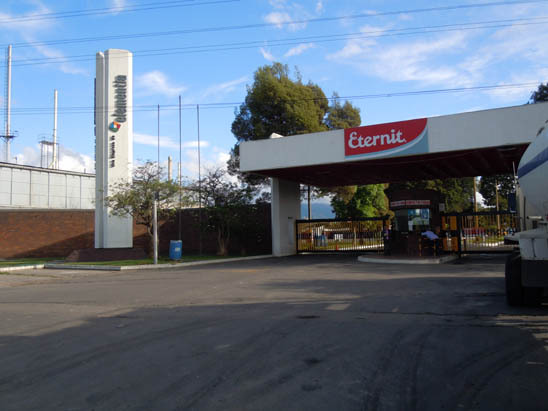 Eternit Colombiana S.A., Eternit Pacifico S.A., and Eternit Atlántico S.A. own asbestos processing factories in Bogota, Cali and Barranquilla; some of these facilities have been operational since the 1940s. Other asbestos-using companies in Colombia include Tecnología en Cubrimiento S.A., Incolbestos and Repuestos Colombianos S.A. Whereas Argentina, Chile, Honduras and many states in Brazil have banned asbestos, Colombia seems to be going its own way. Now, there is even talk of reviving a mothballed and bankrupt asbestos mine Las Brisas, with a report in El Colombiano, the main newspaper in Medellin, stating that the facility has been sold to local investors who hope to recommence production soon.1 The people from the village of La Solita Camp, where the mine is located, called this news a miracle. When Las Brisas was closed in 2011, after forty years of mining, 250 mineworkers lost their jobs. The mine, founded in 1974 by the asbestos giant Johns-Manville, was abandoned by the company in 1998. According to a media release there are more than 2 million tonnes of asbestos at the mine; with monthly production of 1,500 tonnes, the reserves could last for 30 years and satisfy half of Colombia's demand for asbestos. In neither the press release nor the articles found is there any mention that 55 countries around the world have banned the use of asbestos due to its toxic nature. In Colombia, industry lobbyists continue to disseminate asbestos propaganda without opposition from the government, the environmental lobby or trade unions. Comments made in a 2012 article in El Espectador, Colombia's second most popular newspaper, are informative.2 The journalist reported that as a result of rigorous research conducted by leading authorities in environmental medicine, chrysotile asbestos [the type mined and used in Colombia] is not considered to be carcinogenic. Therefore, the journalist concludes, the commercial exploitation of Las Brisas mine is an attractive and safe proposition. Even though the Andean Community, of which Colombia has been a member since 1969, highlighted the asbestos hazard in 2005,3 it seems that the asbestos debate has not yet begun in Colombia. 2 Avanza venta de Minera Las Brisas, en liquidación. [Advance sale of Minera Las Brisas, in liquidation] February 20, 2012. 3 Kazan-Allen L. Unionists Back Asbestos Ban. February 25, 2007.